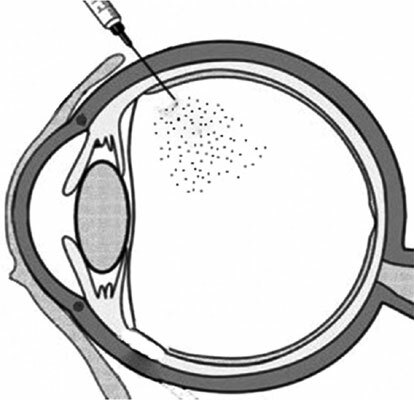 Biodegradable Microspheres as Intravitreal Delivery Systems for Prolonged Drug Release. What is their Eminence in the Nanoparticle Era? Drug administration to the posterior segment of the eye has many challenges due to the natural barriers and consequent problems of low and unpredictable bioavailability. There is an increasing need for managing severe posterior eye diseases, such as age-related macular degeneration, diabetic retinopathy, etc. Most of these diseases, if left untreated, lead to blindness. Traditional ocular formulations and topical administrations are almost inefficient and the drug delivery to the back of the eye requires direct administrations through intravitreal injections of innovative drug delivery systems. These systems must be easily injectable, able to release the drug for a prolonged period of time (to overcome the problem of repeated administrations) and made of biodegradable/biocompatible polymers. Among these delivery systems, microspheres still have an important role. This overview wants to highlight the use of microspheres as intravitreal systems to overcome the challenges of back of the eye diseases. Studies have shown that microspheres are able to enhance the intravitreal half-life and thus bioavailability of many drugs, protecting them from degradation. Furthermore, personalized therapies can be made by changing the amount of administered microspheres. This review focuses on the materials (polymers) used for the preparation of the microparticulate systems and comparative remarks are made with respect to the use of nanoparticles. Posterior segment, intravitreal injections, repeated administrations, prolonged release, microspheres, nanoparticles, biodegradable polymers.